The Church of the Sacred Heart, Arbour Hill, Dublin 7 was given the title “Church of the Defence Forces” in 1997, with the closure of Collins Barracks, which is located directly across the road from the Church. Historically the location is of major significance, since in the grounds of Arbour Hill Church are buried the remains of the leaders who died in the Easter Rising of 1916. The Church of the Sacred Heart, Arbour Hill, Dublin 7 was given the title “Church of the Defence Forces” in 1997, with the closure of Collins Barracks, which is located directly across the road from the Church. 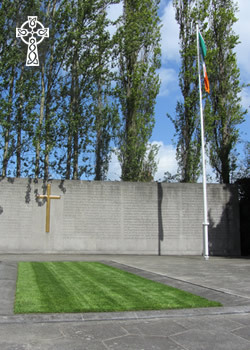 Historically the location is of major significance, since in the grounds of Arbour Hill Church are buried the remains of Pearse, Connolly and others who died in the Easter Rising of 1916. The Church of the Sacred Heart forms part of a tripartite façade – known as Arbour Hill Prison. The church is linked to the main entrance of the prison by screen walls, which extend to the Governor’s House on the far side. This complex of buildings was designed by Jacob Owen in 1835 and later rebuilt by Joshua Webb in 1845. Work on the buildings was completed in 1848. The church has an elaborate cruciform interior and a stained glass window by the Harry Clarke Studios behind the altar. It has an unusual entrance porch with stairs leading to twin galleries for visitors at the nave and transept. This feature is copied from the National Scotch Church, Bow St, London designed by Robert Wallace. Another interesting architectural feature is the Celtic round tower which erupts from a rectangular base.